OH BOY, hot week for yours truly. Drove a $2 million car, drag raced through the streets of San Francisco in a hybrid SUV and used a biodegradable spoon to stir my coffee. All of this was possible because of the Sierra Club, which hosted its first-ever National Environmental Convention and Expo this past weekend in San Francisco. Cars and the Sierra Club? Strange bedfellows indeed, but these weren't the ordinary Fords, Toyotas and Hondas: these were the alternative models. First, I witnessed the unveiling of the 2006 Mercury Mariner Hybrid at the Ford booth. We were told that the SUVan upscale version of the Ford Escapehad been made available on the Internet before its fall debut date and that 800 vehicles had been sold already. Ford also had Steven Hunter, its director of sustainable business strategies, present. Hunter told us the three keys to getting good fuel mileage in a hybrid were: (1) Accelerate at a moderate pace; don't floor it if you want to save fuel. (2) Keep the speed at a steady state; don't slow down then speed up. (3) Because the engine "feeds" off the braking, start braking early and give yourself plenty of room to come to a stop. Now you don't need to go to any of those hybrid-fuel-economy clinics coming this fall. A move that seems silly and off-key is the Mercury Mariner MyDrive Game, which supposedly will teach people how to drive their Mariner the most efficient way possible. It is available at www.marinerhybrid.com, but who's going to play it while Grand Theft Auto is around? 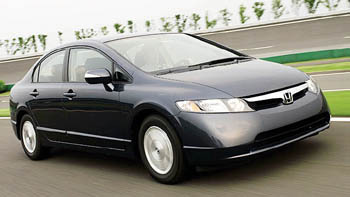 Next up on the press junket was Honda, which, with surprisingly little fanfare, pulled off the sheet for the 2006 model of the Honda Civic Hybrid. It was all low-slung and shimmery. Spokesman Gunner Lindstrom spoke with a cute German accent about Honda's eco-offerings, which also include a FCX Fuel Cell car and a compressed–natural gas (CNG) Civic GX that was being "filled" by a Phill Natural Gas home-pumping station. The Phill-home refueling appliance has its appeals. First, it looks like a heart defibrillator, which will impress your friends. Second, you could lease one of these and never go to a gas station again. Honda's plan for the future is clear: the company wants to develop hybrids, then segue into CNG and finish up with its ultimate goal, the hydrogen fuel cell. But Lindstrom warned this could be a long way off because of cost and range issues with the vehicleand fueling station concerns. We ended the tour at Toyota, where 65 percent of the hybrid market happens and long waiting lists have been a tradition. We were assured that all Priuses ordered would be delivered in less than a month, a welcome bit of news for consumers who have waited up to six months for their piece of the green machine. We then trooped upstairs to the outdoor world, where members of the pressand later that weekend, John Q. Publicwere invited to drive a few of the new "eco-cars." This is how the drag racing began. I jumped into one of the Mercury Mariners, just as a certain newspaperwoman was revving up the Ford fuel-cell car. Going through the course in downtown San Francisco, she and I met at a light. Rolling down her passenger window, she asked, "Wanna race?" I noticed a mist of water coming out of her tailpipehow would she possibly beat me in that? "Uhyeah," I said while my Ford rep laughed nervously. And we were off! I was in the lead, at least two car lengths ahead. We rounded the corner, and somehowI still can't believe she did this with a $2 million carshe swerved, cutting off a van and beat me back to the Expo by an inch. I found out later she was the daughter of a race car driver. Figures. I did get to drive the $2 million car. When I climbed into the vehicle, the rep explained to me before we pulled out into the snarl of traffic: "Million-dollar car, $600 bumper."